what better thing to do on the sunday before christmas but bake? i love candy canes. so a month ago, almost to the date, i experimented with my idea for bringing the candy cake and uniting it with the cupcake. perfection, am i right? it worked out pretty well and response from my testers seemed positive so it was definitely in the starting line-up for the holidays. today, i made several batches of two variations: one white cake and one chocolate. as usual, these may be vegan, but in no way are they remotely healthy. they are packed with sugar and may be slightly addictive. 2. whisk sugar and liquid ingredients in a large bowl. 3. sift dry ingredients into wet mixture and mix until smooth. 4. put fancy cupcake liners in cupcake tray and fill them up to about 2/3. 5. bake for about 22 minutes. 6. let cool completely before icing. follow the same steps as for the white cupcakes. i churned out two batches of each recipe. some for entertaining, some for sharing, some for enjoying on our own. later in the afternoon, long after they’d missed their flight to my friend, katelyn in toronto 🙁 and once they’d cooled, i tackled the icing issue. for 46 cupcakes (we tried two, don’t judge us!) i made the following recipe twice. need help crushing candy canes? just ask twitter. 1. cream the shortening and margarine together. 2. add icing sugar and mix some more. 3. add extracts and coconut milk and keep mixing. 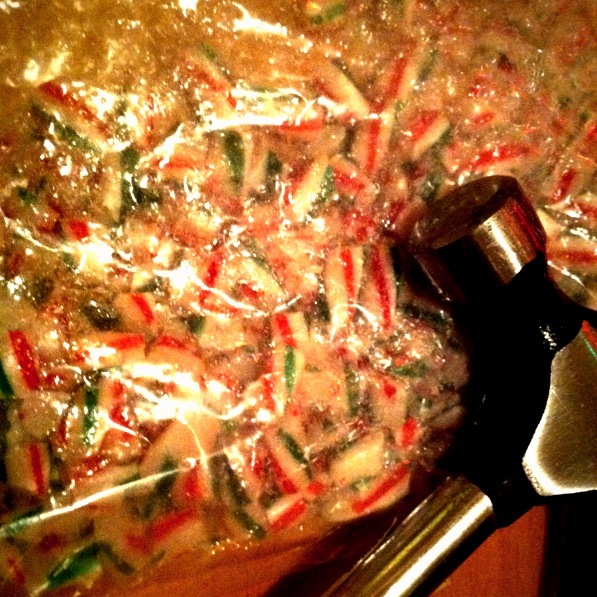 4. mix in the crushed candy canes once you have the icing texture you desire. 5. spread icing over cooled cupcakes.